Ford purchased Jaguar in 1989, bringing money for new model development, better build quality and improvement to the breed. Sold again in 2008 to Tata Motors of India, Jaguar is on a new course in its history as an automaker. We enjoy our modern Jaguar road cars, enjoy your trip through our modern Jaguar production car room! To view our complete Jaguar production car collection, take these links to the Jaguar production cars in production order, Cars to 1968 the Cars 1969-1987 and the Cars 1988 to present and Jaguar Concept Cars. 1988-2008: The Ford Years and XJ220 Supercars! 1988 XJ40 XJ6: The model that almost bankrupt Jaguar, the XJ40. Years in costly development and warranty claims out the roof once it was introduced, the use of lightly tested components took its monetary toll. The new 4.0L was solid and offered superior performance to its replacement. However, the demon Bosch electronics which made it the world's most technologically advanced car when it was first introduced, was also its bane. Its squared off design turned off the purists and are largely unloved by Jaguar enthusiasts today. Model by CORGI 1/36 1988-1996 XJ-S: The XJS was introduced in 1975 as the two-seater in the Jaguar model range, although it was classified as a 2+2. Available in coupe form only until 1988, the XJS convertible was introduced in reaction to demand from the American market. 1989 was the best year for sales of the XJS, as there obviously was a demand for top down Jaguar motoring. Powered by either a 6.0L V12 with 308 bhp available, or 4.0L six, producing 223 bhp, the XJS was refined open air motoring, not a sports car, but a grand touring car of the first order. Model by HIGH SPEED 1/43 1988 XJ40 (XJ6): Of the XJ6's I've owned, my XJ40 was both my favorite Jaguar sedans, as well as my most despised. It seemed like some Bosch electronic module was always in need of replacement. At the same time, it was the best handling, quietest and best riding XJ6 I'd owned, including my X300's. Unappreciated today, low mileage examples can be had cheap and the post-1991 cars benefitted from Ford's quality control, so they are extremely reliable. This is what my personal car looked like. 1991-1996 XJS: The XJ-S was given a facelift in 1991 as an approach to try and keep the car fresh and sales going. Renamed the XJS, it was featured almost an entirely new body shell and continued to be offered in coupe and convertible versions. The XJS had both the 4.0L six and 6.0L twelve-cylinder engines. The V12 produced 318bhp. The end came as Jaguar prepared for the launch of the new XK8. A bit of the XKS lived on though, the XJ8 used its platform. The XJS had a long run, with over 115,000 produced over 25 years. Model by DETAILCARS 1/43 1992-1994 XJ220: The Jaguar XJ220 is a mid-engined sports car produced in collaboration with Tom Walkinshaw Racing as JaguarSport between 1992 and 1994. Originally designed with the thought of using a V12, a twin-turbo 3.5L V6 based on the engine used in the Rover Metro 6R4 rally car was used instead. Generating 549 bhp - The name XJ220 was assigned as a reference to the targeted top-speed of 220 mph. The world economy and lack of demand for high performance supercars signalled the XJ220's departure after two years and 281 cars were made. Model by MAISTO 1/18 1992-1994 XJ220: I was lucky enough to attend the N. American launch of the XJ220. I remember the awe and fascination of seeing this car for the first time and thinking that Jaguar had just taken the automotive world by the b*lls! In my opinion you have to see this car in person to fully appreciate the lines and look of this Jim Randle designed car. The world economy and lack of demand for high performance supercars signalled the XJ220's departure after two years and 281 cars were made. 1992-19994 XJ220: The five 'official' colors for the XJ220 were Monza Red, Spa Silver, Le Mans Blue, Silverstone Green and Daytona Black. However, some cars were painted in custom colors for their owners, such as this one in canary yellow and six other variants of black, green white and red. In keeping with the Jaguar tradition, color choice beyond what was available from the factory was always a special order option. Model by MINICHAMPS 1/43 1992-1994 XJ220: I first saw the XJ220 at the US introduction of this car in Monterey in 1992. Jaguar was the featured car at the historic races and Friday night of that weekend a blue XJ220 like this was parked in the Jaguar dealer's show room under the lights. It was a beautiful sight and unlike anything I had ever seen before. Parts of the XJ220 styling made it onto the XK8/XKR cars. Simply stunning! Model by SPARK 1/43 1993 XJ220S TWR: In early 1993, Tom Walkinshaw Racing (TWR) and Jaguar Sport launched the XJ220C to compete in the FIA GT class at Le Mans and other race venues. In order to meet homologation requirements, they announced the XJ220S, a limited production, road going version. It was the fastest production car in the world at the time. The aluminum body panels were replaced with carbon fiber and the twin-turbo six tweaked to produce 680 bhp. The car could accelerate to 60 mph in 3.3 seconds and reach 228 mph. 1994-1997 XJ6: A new body design and a new engine debuted on the XJ6 in 1994. The X-300 replaced the XJ40 and was the first new model to be produced under Ford ownership. Using the new 4.0L AJ16 engine, the new design incorporated new styling elements while retaining classic Jaguar lines. This is the supercharged XJR version, which bumped the six-cylinders hp from 249 to 326. The X300 was the last of the large Jaguar sedans to have a six-cylinder engine. Model by MILESTONE MINIATURES 1/43 1998 XK180: The XK180 made its debut at the 1998 Paris Motor Show. There were two cars made, with the second debuting at the 2000 North American International Auto Show in Detroit. The Detroit car was in the same green as the Paris car, but it was LHD and had the brown interior which shows up on the majority of diecast replicas. The silver paint scheme appeared on the F-Type mock-up in 2000, which was very similar to the XK180 in appearance. Model by WELLY 1/24 1998 XK180: Although the XK180 never made it to production, parts of it did. The XKR was launched in 1998 and aside from shared styling elements, it featured the supercharged engine of the XK180. In 1999, Jaguar introduced the 20" split rim BBS wheels as on the show cars (Paris & Detroit) and low profile Pirelli tires, larger Brembo brakes and rotors, as well as enhanced suspension components became an 'R Performance' package available on the XKR. 1998 XK180: The XK180 was a styling concept car which was strongly considered for production. Created to celebrate the 50th anniversary of the XK series sports cars, the XK180 design draws inspiration from some of the most successful production and competition cars of Jaguar's history. A fully running prototype, the engine is a supercharged and intercooled variant of the AJ-V8, modified to achieve an output of 450 horsepower. Model by MAISTO 1/18 1998 XK180: The XK180 pictured with the XKR. The 'R' Performance options for the XKR were inspired by the XK180, including brakes, suspension and 20" wheels like the BBS Paris wheels seen here on the XK180. Our XKR came with these two-piece wheels. Model by SPARK 1/43 1998 XK180: This is the original XK180 in proper interior paint scheme and with Paris BBS wheels. This is the only XK 180 model I know of made in this scale. Jaguar is now producing the new F-Type which was based on the XK 180. The project was given the green light back in 2000, but pulled back. If produced, it would have been Jaguar's next supercar. Model by PROVENCE MOULAGE 1/43 1998 XK180: The Jaguar Model Club existed in the late 1990's - early 2000's. Besides producing an excellent newsletter covering Jaguar models and collectibles, the club produced some very fine limited run models. This XK180 produced by the Club (#47 of 50), was painted in original paint from the XK180 project, obtained from Jaguar Special Vehicle Operations. 1996 XK8: The XK8 was the replacement for the XJS. From a styling perspective, it took styling cues from the E-Type of a curvaceous frontal aspect, long hood and short rear deck, and was an instant hit. Available in coup� or convertible body styles and with either a supercharged 370 hp, or naturally aspirated 290 hp engine, the supercharged variant is known as the XKR. Model by MAISTO 1/18 1996 XK8: The XK8 heralded a change in direction for the company, resulting in the S-Type and X-Type. In 2005 the grille design of the XKR was refreshed and the car underwent a major face-lift in 2007 to give it a more contemporary look. Model by Schuco 1/43 1996 XK8: Both the XK8 and XKR are electronically limited to a maximum of 155 mph, but are capable of much higher speeds. This model is in British Racing Green. 1996 XK8: A teal interior with Sherwood Green, I can't say its my favorite color combination. Model by VITESSE 1/18 1998 XKR: Supercharged 4.0L V8 producing 370 hp. A great touring car. 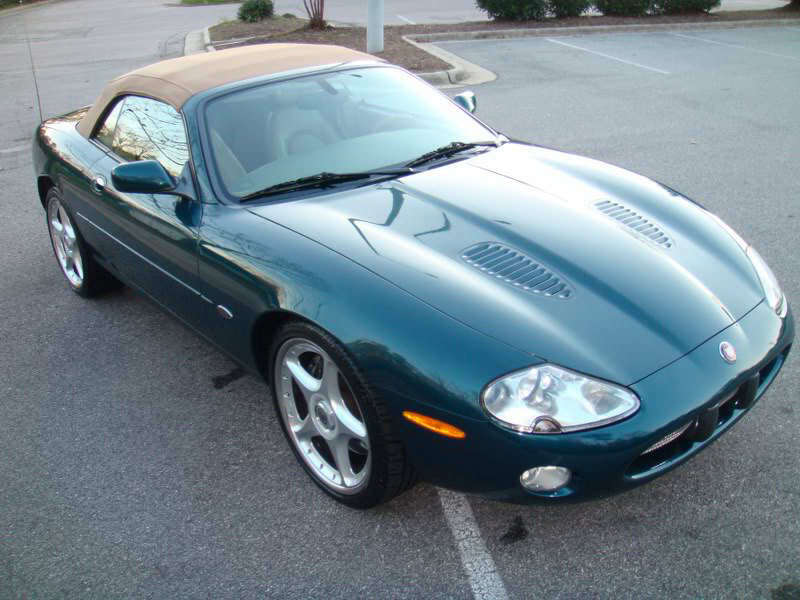 Our 1/1 XKR is Aspen Green Mica with a Cashmere interior (see photo at top of the page.) This car is in Phoenix Red. 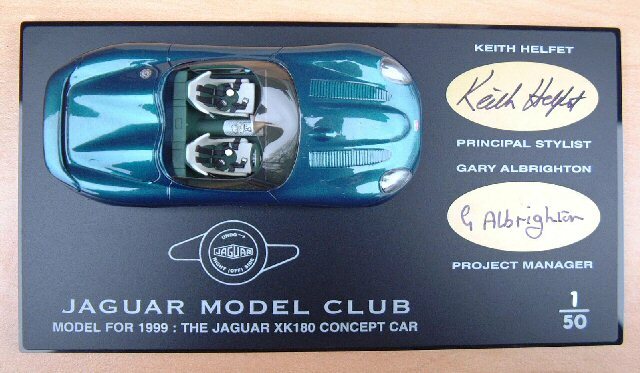 Model by MAISTO 1/18 1998 XK8: A fine model in Emerald Green which in 2003 became Jaguar Racing Green. In 2003 the engine size increased to 4.2L and the XKR produced 400hp. 2000 XK8: Another XK8 convertible in Platinum Silver. Model by AUTOART 1/43 2000 XKR: Another XKR convertible in Phoenix Red. Model by VITESSE 1/43 2000 XKR: Again in Phoenix Red with top up. I am working on all the color variations of both XK8 and XKR, convertibles and coupes'. 2000 XK8 Coupe: The designer of the XK8, Ian Callum, was also responsible for Aston Martin's DB7 and Vanquish coup�s, which explains the similarities in design among the three cars. I like the lines of the coup� over the convertible, as it looks to me that was they way it was intended to be made, although in reality it was designed first as a convertible. This gives the convertible and the coup� two distinct looks. This car is in Antigua Blue. Model by VITESSE 1/43 2000 XK8 Coupe: This car is in Topaz. Model by VITESSE 1/43 2000 XK8 Coupe: This car is in Carnival Red. 2000 XK8: This car is in Phoenix Red. Model by AUTOART 1/43 2000 XKR : This car is in Anthracite (black). Model by AUTOART 1/43 2000 XKR Coupe: This car is in Phoenix Red. 2000 XKR Coupe: This car is in Carnival Red. Model by VITESSE 1/43 2000 XKR : This car is in Amaranth Mica (purple). Model by MAISTO 1/18 2000 XK8 Coupe: This car is in Carnival Red. 2002 XKR: In Aspen Green, an '02 model year only color. Model by VITESSE 1/43 2002 XKR: Part of the Old Irish stable of cars, our Aspen Green XKR has the rare R Performance options. Model by JAGUAR 1/1 2002 XKR: Again in Aspen Green, has pre-2001 seats though. 2000 XK8: This is another XK8 convertible in Meteorite Silver, one of two silvers offered by Jaguar at the same time in 2000. In 2001 the headrests on XK8 and XKR models became adjustable. Model by Quartzo 1/43 2000 XKR: Platinum is the other silver as shown on this XKR model, although darker than the shade on the XK8, this color would continue on in production, the other would not. Model by VITTESSE 1/43 2000 XKR: The villan in the movie Die Another Day chased James Bond across a frozen lake in this highly modified XKR. Unfortunately none of these mods made it to the R Performance models. They would have been handy in traffic! 1999 S-Type 4.0: Using retro styling cues from 60's Jaguar sedans, the S-Type (a retro model name) was the first real fruit of the Ford-Jaguar partnership. Born as the classier-looking twin of the Lincoln LS, the S-Type was the brand's first true competing model in the modern mid-size luxury segment. Powered by either a 3.0L or 4.0L V8, producing 281 bhp in 4.0 trim. In 2003, the "R" supercharged version of the now 4.2L V8, cranks out 400 hp. A six-speed automatic transmission sends power to the rear wheels on all trims. 2000 S-Type 4.0: In production for ten model years, the S-Type was only given minor facelift and mechanical upgrades. In the end, the styling, which also was heavily borrowed by the Ford Taurus, was just too staid for the market and production numbers fell as sales dropped off. Replaced by the new contemporary XF, the S-Type has become a great used car bargain! This is one of the few S-Type models available in LHD in this scale. 2000 S-Type 3.0: Surf's up! Model by KINSMART 1/38 2000 S-Type 3.0: Better than collecting shells! 2000 S-Type 2.5: It makes sense that Royal Navy would have the smallest displacement petrol engine available, the 2.5L V6. Regardless, its a great car! The treat the bomb squad well. In the USA, Jaguar flooded the market with program cars and lease returns, which impacted already slow sales. They were mostly 3.0L cars, but it adversely impacted the values of unsold cars, as well as the cars of owners that had stepped up and paid close to full retail when the car was new. That disenfranchised them to buy another sales waned and the S-Type ended in 2007. Model by UNKNOWN 1/43 2002 S-Type 3.0: In the unlikely event that the RCMP had an S-Type, it would probably be a 3.0L for high-speed pursuits. However, I am reasonably certain the RCMP markings are fantasy. Then again, in wealthy N. Vancouver... The 4.0L S-Type to this day remains the best handling sedan of its size I have ever driven. The "R" just intensifies the experience. If I had ample garage space and financial resources were not a problem, there would be an S-Type R parked there. I'm that serious that they are that good. Try one! Model by UNKNOWN 1/43 S-Type & Mk2: The S-Type styling borrowed heavily from the evergreen Mk2 of the 1960's. While it was aimed at traditional sytling, it did not give Jaguar access to the market which preferred more contemporary styling. A lesson Jaguar would never learn under Ford ownership. To make matters worse, Ford borrowed styling cues from the S-Type for its Taurus model, further watering down the S-Types appeal. Fantastic sedans let down by management too deeply mired in tradition. With the introduction of the XF, Jaguar proved this smaller sedan concept works! Model by MAISTO 1/18 2002 XJR: Flagship of the Jaguar sedans, the XJR combines the high-performance and luxury that has made the Jaguar name and prestige what it is. With a 4.0L super-charged V8 producing 370 bph, the XJR is a fast, comfortable, relaxed way to get from Point A to Point B. A limited-edition XJR called the XJR 100 was available in 2002 only. The XJR 100 came only in black (paint as well as exterior trim) with black leather interior. Features exclusive to the XJR 100 were unique alloy sport wheels, gray-stained birdseye maple trim, red badges and red stitching throughout the interior. Only 500 XJR 100's were produced. Model by AUTOART 1/43 2004 X-Type Wagon: Jaguar introduced an entry level compact car in 2002, designed to compete in the market of the BMW 3 Series. In 2.5L and 3.0L variants, this all-wheel drive car was fun to drive, but lacked contemporary styling to appeal to a younger market. Comparisons were made with the Ford Mondeo it shared a common platform with and sales lagged. The estate wagon was introduced in 2004 and continued until 2009 when production of both the sedan and estate versions ceased. These were practical, great handling AWD wagons and I wish I had had the opportunity to own one. They are fairly rare in the USA. 2002 XJ8: This was the final year for the X308 cars, which were in production from 1997-2002. This car is in Maderia (maroon) paint, very majestic! Model by AUTOART 1/43 2002 XJ8: At one time I started to collect all the production colors in 2002, therefore so many sedans. 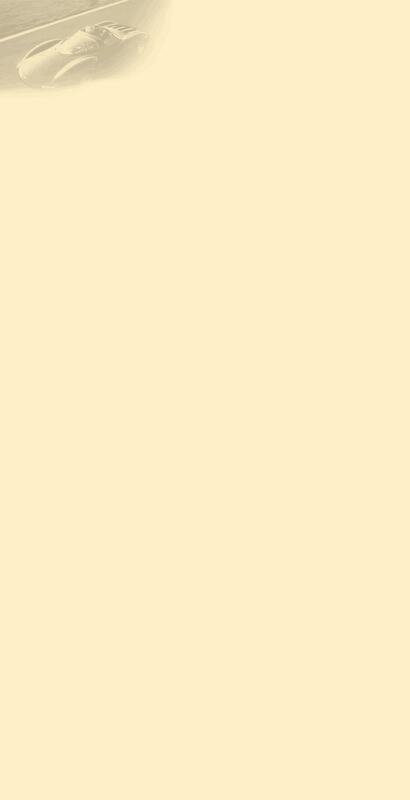 This one is in Topaz, which is just a fancy name for gold. Model by VANGUARDS 1/43 2005 XJR: The X350 version of the XJR, now with a larger 4.2L engine super-charged engine, produced 400 bho and has a top speed of over 150 mph, with power to the road through a ZF six-speed transmission and 18" or 19" alloy wheels. This compares with the 4.2L XJ8 with 300 bhp and a similar top speed, just not as quickly! This is another Pacific Blue car. Model by VANGUARDS 1/43 2005 XJR: The "R" badge on this gray beauty says it all. Not the fastest big sedan on the markey, but the one that has the most character and style! 2005 Daimler Super Eight: After a three year absence, the Daimler nameplate reappeared in 2005 as the top model in the XJ range. The Super Eight was powered by the 4.2L V8 supercharged engine which produces 390 bhp. The car is derived from the Jaguar XJ (X350) and was the Daimler badged equivalent of the XJR. In the US market it was known as the Jaguar XJ Vanden Plas. Model by UNIVERSAL 1/43 2007 XKR: A great ride to the racing paddock! While I own a XKR convertible, I still believe the coupe is the better looking car. This is the new series XK introduced in April of 2006. Model by MININCHAMPS 1/43 2007 XKR: In '03 the XK series received the larger 4.2L engine, along with a six-speed automatic. For the 2007 model year, the body style was revised, producing a car that was slightly larger and lighter than its predecessor and over 400hp. 2007 XKR: Restyled, the The XK features an advanced paddle shift gearbox that enables the driver to either use it as one would a standard automatic gearbox, or an automatic gearbox featuring faster shifts by using the sport mode. Alternatively, the driver can take full manual control of the gears by means of two paddles situated behind the steering wheel, affording the driver optimum control in fast driving. Model by MINICHAMPS 1/18 Jaguar XK8 & XKR's: Models by the 3-M's, Mattel, Matchbox and Malibu of the XK8 in coupe form. Models by VARIOUS 1/64 & 1/87 2003 R-D6: From the Jaguar press release: "The R-D6 concept signals a dynamic future for the Jaguar marque, true to its core values of providing sporting dynamic luxury." "Using aluminium and composite materials for the chassis and body, R-D6 weighs just 1500kg." "With horsepower in excess of 230bhp, the V6 diesel engine endows R-D6 with the pace to satisfy its looks and R-Performance rating. Acceleration from standstill to the benchmark 60mph takes less than six seconds. Top speed is an electronically limited 155mph. Notice some of the style features that carried over to the XF. Wow! 2008 XF: The Jaguar XF was launched in 2008 and replaced the S-Type in the company's lineup. The styling of the XF incorporates an oval mesh grille harking back to the original XJ of 1968 and is destined to be a feature of future Jaguars. The basic sub-structure of the XF has been carried over from the S-Type, the suspension and mountings are the same as that used on the XK, while the engine line-up is basically as that used in the S-Type. The base model is the 3-litre V6 and two versions of the well-regarded Jaguar AJ-V8 engine are used in 4.2-litre form. The naturally-aspirated version produces 300 bhp, whilst the supercharged used on the SV8 model produces 420 bhp. Model by MINICHAMPS 1/43 2010 C-X75: The C-X75 was named in honour of Jaguar�s 75th anniversary, the C stands for concept and the X for experimental. It is a plug-in hybrid, two-seat, concept car from Jaguar which debuted at the 2010 Paris Motor Show. The C-X75 produces 778 horsepower through four electric motors, each of which drives one of the four wheels and can reach a top speed of . The batteries driving these motors are recharged using two diesel-fed micro gas turbines. Jaguar plans a limited production run of these cars beginning in 2013. Model by SPARK 1/43 2010 XKR 175: The XK was given a facelift in 2009, along with a 5.0L V8 engine, which of course is supercharged in the XKR, which produces 523 hp and is electronically mimited to 175 mph. The XKR 175 is a limited production run of 175 cars (all in black) to the N. American market to mark Jaguar's 75th anniversary in 2010. I want one! 2011 XKR-S: Introduced at the Geneva Auto Show in 2011, the XK series of Jaguars had another facelift, taking on a more aggressive look. Powered by the supercharged AJ-V8 Gen III R direct-injection engine producing 542 hp, the XKR-S with its all-aluminium monocoque chassis, is capable of 186 mph. That makes it the fastest true Jaguar production car to date (the limited production XJ220 was capable of 220mph.) A XKR-S GT will be making its way to my garage in the not too distant future! Model by IXO 1/43 2011 XJ: The XJ has been Jaguar's flagship model since 1968. The latest version launched in 2009 (X351), is an all-new exterior design and a break from the XJ series mould carried over on all previous generations. It is a longer, wider car that looks much bigger than its predecessor. Powered by the 5.0L V8 (normally aspirated or supercharged), or a twin-turbo 3-litre diesel, for 2013 a 3.0L supercharged V6 was introduced to the lineup. The car is also available in standard and long wheelbase versions. Model by IXO 1/43 2011 XFR: In 2011, Jaguar gave the XF a facelift with front and rear styling changes which are based on the original Jaguar C-XF concept car, The XFR was announced at the Detroit Auto Show in 2009, as a new performance derivative of the XF range. It features the 5.0L supercharged AJ-V8 engine rated at 500 hp, providing a top speed of 155 mph. In 2013, R-S version of the XF was confirmed, which will use the same 5.0L supercharged V8 engine as the XKR-S.
2013 F-Type S: The introduction by Jaguar of the F-Type, was similar to the introduction of its spiritual successor the E-Type, 40 years earlier. The F-Type is the first true two-seat sports car produced by Jaguar since 1975 and is based on a shortened XK Chassis. The F-Type comes in either a 3.0L super-charged V6, producing 375 hp (red car), or the V8-S model with a supercharged 5.0L V8, producing 488 bhp and mated to a 8-speed manual transmission. The F-Type convertible was joined by the coupe in 2014. 2015 XKR-S: The pinnacle of the XK range before production was ended to focus the Jaguar market on the F-Type and not over dillute the product range as Jaguar had done in the mid-60's with its sdan range. Lessons learned, besides the platform of the XK range was getting dated, going back to the XJS. Oh what a car though, 542 bhp from the 5.0L super-charged V8, with 4.2 0-60 times. My greatest hope is that when they become affordable for me to own one, Im not too old to be able to handle all that power! My dream car, in this color for sure! Model b y MSZ 1/32 2016 XE-S: Joining the Jaguar sedan line-up in 2016 is the new XE, a compact sports sedan built with Jaguar's Advanced Aluminum Architecture. The XE will join the XF and XJ models and is designed to compete with entry level BMW, Mercedes, Cadillac and Lexus sedans. Unlike the X-Type, Jaguar appear to have gotten this one right and the XE range will feature three models, with the S at the top of the range. For starters the USA will get a 3.0L six-cyl. (340 bhp) and later a 2.0L diesel, with optional all-wheel drive and an 8-speed transmission. Model by PREMIUMX 1/43 2016 F-Pace R-Sport: Announced at the 2015 Detroit Auto Show, the F-Pace is Jaguar's first venture into the compact luxury SUV market. The F-Pace offers the praticality of an SUV, along with the handling of a sports car and Jaguar Styling. The F-Pace is available in several trim variants and four diesel engines and three petrol engines are avaialble in 2.0L and 3.0L displacements depending on which market the car is being sold in. All diesel engines are turbocharged, and the 3.0L petrol engines are supercharged. The F-Pace is available in either RWD, or AWD. This car is a R-Sport, which indicates it has adjustable suspension, the 3.0L supercharged V6 engine, which produces 380bhp and a top speed of 155 mph. Grace, Space, F-Pace!